Then they did timing tests to confirm which routes where available to get Oswaldd from the 6th to the 2nd in time. The only possible path to make the transit was decided to be the stairs. Stairs that involved crossing a segmet of each floor on the way down. Why isn't the very next step to confirm with the 17 staff who were located between the 2nd and 6th floor, if they were in a position to monitor the stairs? Of course they had Adams claiming to use the stairs but she and Styles descent was pushed to a latter descent. If the Stroud document is genuine they know that Garner had some visiblty of the stairs and backed Adams an Styles' early descent. Of course they could have asked Dorman, whose testimony describes moving quickly to near where Garner was, including using the word "run". So WC defenders, surely the path being clear is an essential part of confirming the suspect as the shooter? So was wasn't an attempt made to confirm the path was clear, or were the WC afraid of what it might bring up and hushed up the evidence of the path being blocked? The Adams and Styles descent was pushed to a later descent by Adams herself and by the fact that they never encountered Baker and Lovelady on their way down. The path on the way down was clear. The only person who placed himself anywhere near the stairwell was Jack Dougherty. However, that placement is highly doubtful. Dougherty was not reliable, due to no fault of his own. Going from memory here, but didn't Adams later deny having said that to the authorities? First off, I said Baker and Lovelady when I meant Baker and Truly. 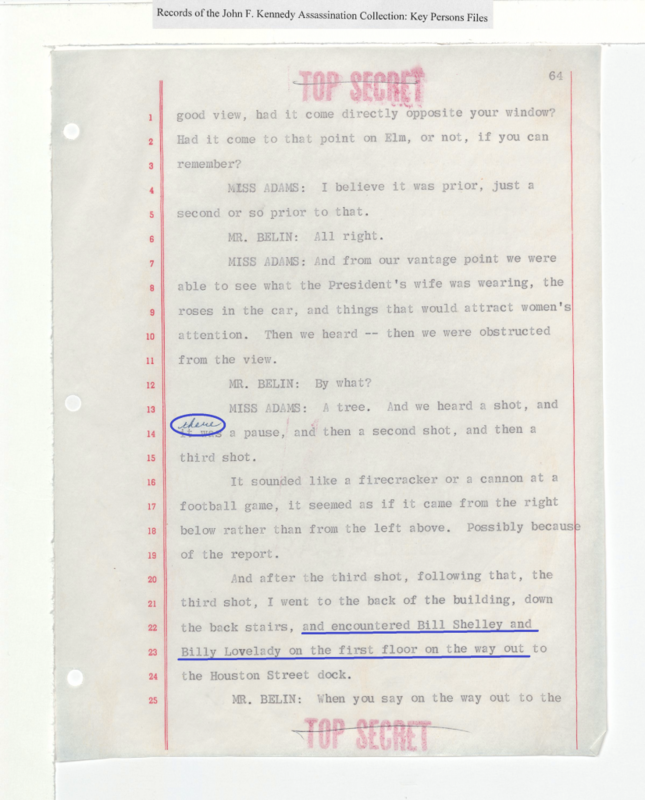 According to Barry Ernest, Adams denied that she told the WC and James Leavelle that she had encountered Billy Lovelady and Bill Shelley upon reaching the first floor. That may be what she recalled four decades after the fact but we have her signed deposition , including a page of it on which she notated a part that she believed to be in error. If Adams left the 4th floor almost immediately and wasn't seen by Truly/Baker on the way up, then wouldn't she simply be just ahead of Oswald all the way down, why does Oswald need to pass the women on the stairs? Problem is that if, as Stroud document indicates, that Garner was following Adam and Styles, and was close enough to hear them going down the stairs and then sees Truly and Baker come up. It leaves a very small window for Oswald to somehow sneak past Garner. It isn't the girls on the stairs that is the real challenge but Garner at he rear of the 4th floor. Garner's time could have been confirmed by Dorman, who is usually held to be the fourth of the ladies to move but uses very immediate language in regards to her following Garner and uses the word "run" to describe her movements to where Garner was. The 2nd floor meeting is constrained by Truly and Baker's ascent time and Reid's ascent and crossing paths with Oswald. I haven't read "Girls on the Stairs", but does anyone know if Dorman was asked if she saw Truly and Baker going up? My issues is not that I can prove that Oswald couldn't have used the stairs, but that the investigators should have confirmed the stairs were clear for him to use. Having not interviewed all the staff between the 2nd and 5th , on if they could view or where viewing the rear stairs , we can have no certainty that the stairs where clear for Oswald to traverse. Perhaps, but if that were true, wouldn't he be seen by (at least one of) the women that remained the 4t floor? Garner saw Baker and Truly come up, after Adams and Styles went down, so she must have been close to the stairs, right? why does Oswald need to pass the women on the stairs? Adams denied that she told the WC and James Leavelle that she had encountered Billy Lovelady and Bill Shelley upon reaching the first floor. Garner went to the back of the fourth floor, Dorman then joins her there. The three guys on fifth went to the west side to look out where people seemed to be moving, one of them indicates he saw a policeman passing by to the lift. How about the movement and view of the rear stairs by any of the other staff? We simply don't know as the DPD and WC didn't seem to think it important to confirm if anybody was in a position to confirm anybody using the stairs. Of all the people we do know about inside the TSBD between the 3rd and 7th, 5 out of the 8, had common reaction to leave the South side and look out the West side of the building (and 2 went outside, and JED went up and down a lift), as that is where people outside seemed to be moving towards. Moving to the West wall placed them in a better position to view the ongoing commotion outside but also to observe and hear movement across their floors from the stairs in the North West corner. The question "Did you see Oswald?" should have been joined with, "Could you see the rear stairs and did you see anyone using them"? LN'ers why didn't they ask this obvious question?